If there's an incarnation of the Devil in this world, he lives in the City of Gold and Lepers! The City of Gold and Lepers was a prophetic science fiction / adventure novel written by Guy d'Armen in 1928, probably inspired by Fu-Manchu (1913) and predating Doc Savage (1933). Tibet, 1927. Intrepid explorer Doctor Ardan is taken prisoner by the diabolical Natas, who has discovered the secret of making gold through nuclear fusion, and rules over a city of slaves whom he controls with an unholy brand of leprosy. 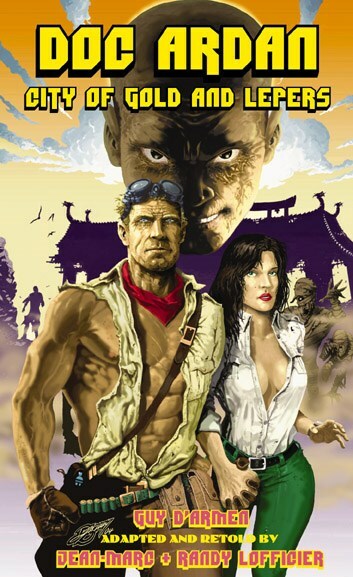 Can Doc Ardan, with the aid of beautiful Louise Ducharme, thwart the Oriental Mastermind's evil schemes and escape from the City of Gold and Lepers? Scientist and world-saving explorer Doctor Ardan was created in 1928, five years before Doc Savage. This ground-breaking SF adventure that predicted the use of nuclear energy 16 years before the Manhattan Project has been translated by award-winning authors Jean-Marc & Randy Lofficier and includes original black & white illustrations and a historical foreword about the Ardan family, from Michel Ardan (From the Earth to the Moon) to Dale Arden (Flash Gordon). This is a fast, fun read and a highlight of French pulp fiction. Much like the recent release of Doctor Omega, also by this same publisher, this novel features some illustrations from the original novel, some social commentary, and a great storyline with interesting characters on a grand adventure. They simply don't write books like this anymore, which is a great pity. It succeeds on all levels very well and is very worthy of a place on your bookshelf.